Click sample opening speech to know how to start your speech. 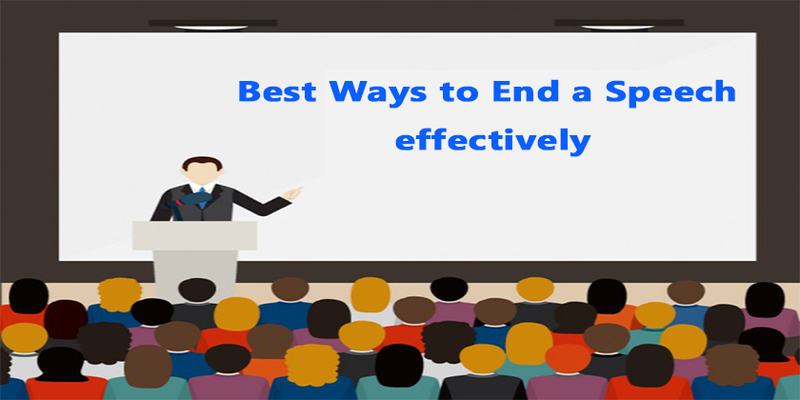 In the article below I will talk about best ways to end a speech effectively. You will know about three excellent ways to end up your speech. Remember your conclusion is the most important part of your speech, because that is what stays in the audience minds when they forget everything else. I as presenter recommend you to make the mistake of giving the conclusion too short. A good conclusion must last between 10% to 15% of your speech. As an illustration, a 7 minutes’ speech must have 1 minute conclusion. The main goal of your conclusion is obviously to sum up of your speech. For instance, you have bought a present to give it to someone, but before giving you will cover it up properly and nicely. So ending speech can be somehow like this, you have the introduction, elaboration and finally you will cover up what you have said in your whole speech. Here I want to focus on the main part of the conclusion. That’s your final message. Most of the speakers simply end their speech by saying “thank you.” “Or are there any questions” and that’s the only message that their speech is over, I crunch. “Thank you and are there any questions” should come after the clapping, not before, and this only possible if you present a strong final message. Most of the people, in the conclusion come with the story told in the introduction, which can be a great technique. If you end with a call to action, it must be short, clear and well phrased. Some the people end their speech with the title, which is also a great technique. Another way to end a speech is to say any good quotation. If you end with a quotation, it must be relevant and specific. Your quotation will be more effective if it’s personal, or if it comes from a person well known by your audience. Here I elaborated three effective ending: 1. Striking Story 2. Call to action 3. Memorable quotation.